We have a chartered Embraer 190 (about 90 seats) to take 13 of us over the Caspian to the capital of Turkmenistan. TC Ted gets his own seat, so he makes 14 and there are three cabin attendants. For lunch we are given a hot pancake with chocolate sauce and canned fruit cocktail. The airport is all white marble, green and gold, with every modern device possible and cascades of automatic escalators and moving walkways. It is eerily absolutely deserted – even more so than the one in Pyongyang. There are machine passport readers and scores of x-ray scanners. Maybe the men on customs duty are bored, but they find something to question in everyone’s case. They are particularly interested in medication, so Tino gets a hard time, until ennui sets in for them again. Our hotel is a smaller version of The Sail in Dubai. We can see it as we come into land, standing proudly isolated outside the city. And as for the city, if other capitals have been space age this one is in another galaxy. It’s all white marble. I’m going to change my mind about where Kim Jong-un got his inspiration. This place is Abu Dhabi meets Las Vegas meets Pyongyang. It’s so over the top I’m almost lost for words. 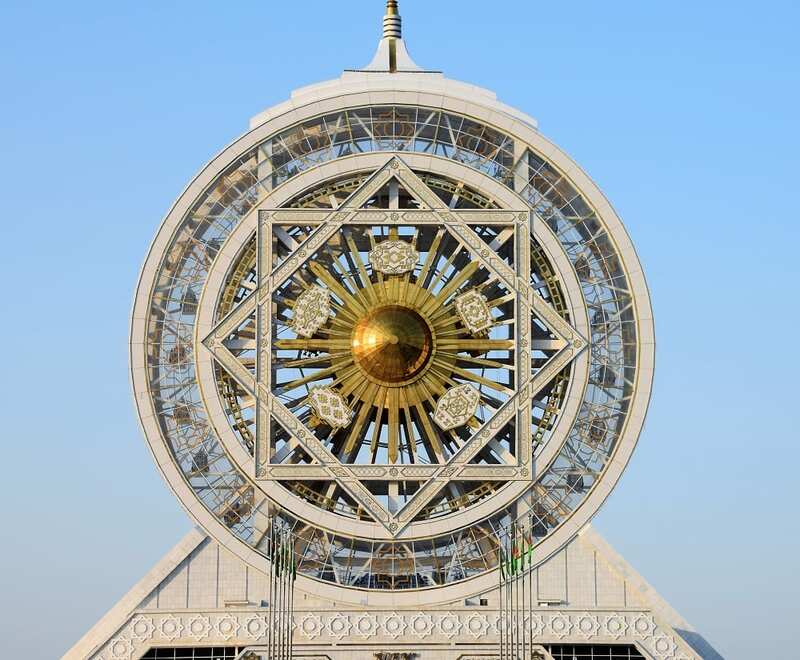 Ashgabat was rebuilt in Soviet style in the mid-twentieth century. These monoliths have all been re-clad in marble. Some have had neoclassical pillars added. 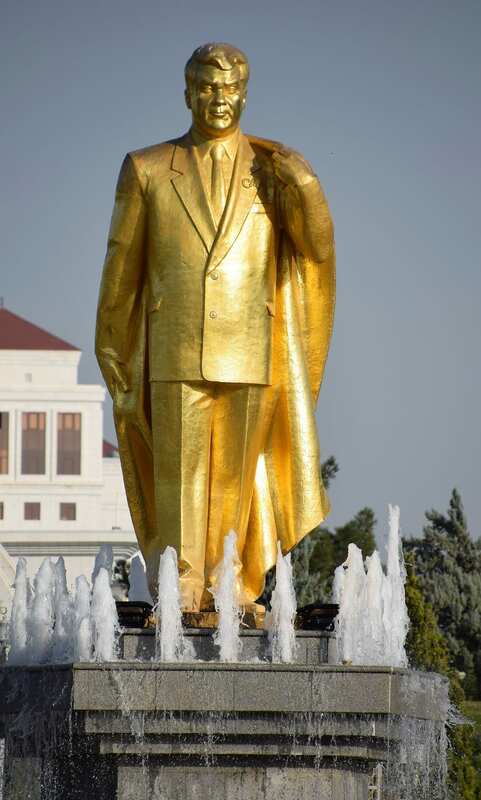 The city is now additionally filled with grand monuments honouring former president Saparmurat Niyazov- or Turkmenbashi. (The name Turkmenbashi means exactly what it suggests, Leader of the Turkmen.) This manwas a specialist in building a personality cult. He renamed the city of Krasnovodsk after himself and then set about placing gold statues of his image around Ashgabat. Just as in North Korea, there are statues to commemorate the dead and pictures for the current incumbent. The current president was born sixteen years later and is, officially, no relation. But he looks uncannily like him, as is evident from his many pictures. The opposition party (at least there is one) have dubbed him The Turkmenator. 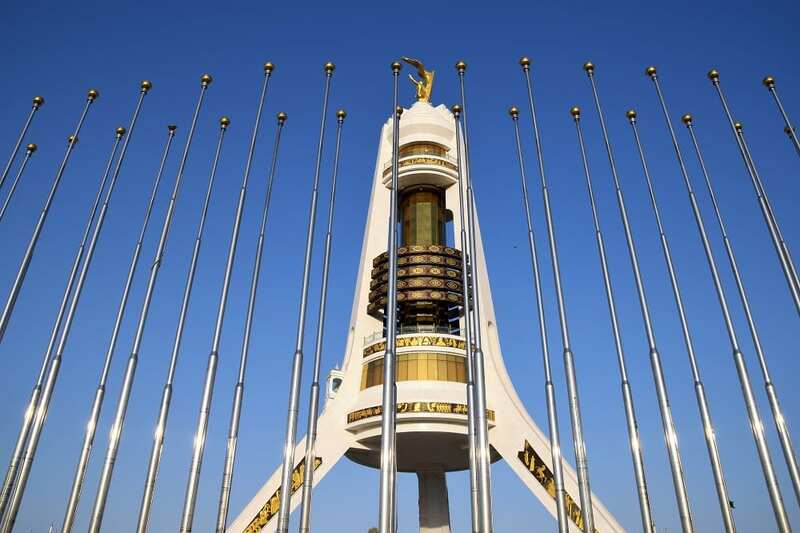 There are also gold domes, towers, an enclosed Ferris wheel (unsurprisingly unique in the world) , towering pillars, a rocket shaped memorial, a whole line of sports stadia, strings of fountains, parks and a multiplicity of other extravaganza. The highlight is the tripod/rocket shaped Neutrality Monument. (Apparently, Turkmenistan is the first officially neutral country in the world. I will have to check that. What about Switzerland? ) This is all in the new town, which is criss-crossed by three lane highways. The gantries, lamps and traffic lights are white, with a filigree gilt finish and there are videos running on LCD screens (with white and gold frames) at the sides of the road, showing the president and other dignitaries working, and also, bizarrely, fun fairs and other jollity. 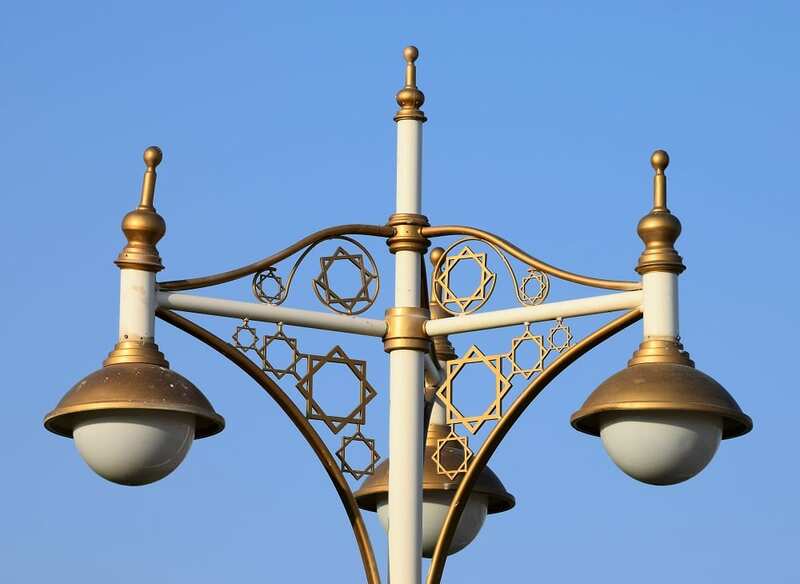 There are no people around here, other than cleaners, pretending to sweep and wash the stone paths and men on mobile platforms polishing all the numerous lamps that illuminate them. The many elite apartment blocks look empty and another car on the mega highways is an event. Our guide says that the old town is livelier- he lives there- but we haven’t been taken to visit it. There are a few more people in evidence today. It’s nominally an Islamic country and only 30% of the population are practising Muslims, but the women are fully covered with very long skirts. Before they are married they sport small skull caps and long plaits. When partnered up they move on to bright headscarves, tied to make it look as if they have as much hair as possible, Iranian style. (Iran is only just the other side of the mountains). Some of the men wear small skull caps too. They are all very reluctant to have their photographs taken. Elvin says that newly married women are forbidden from speaking to their fathers in law at all. When they have had a baby they may inquire what he wants for dinner. There’s also almost a small traffic jam in another part of the new city as we progress to and from the mud remains of Graeco-Roman Nisa. The most exciting thing to do here is walk round the mud ramparts for the views of the mountains and the Kipchak Mosque gleaming in the haze. There’s also a green roofed village nestling below the peaks, the remnants of old Soviet collective farms. Winter wheat and cotton are major crops, as well some grapes. The guide says the wine isn’t very nice, it’s very sweet. 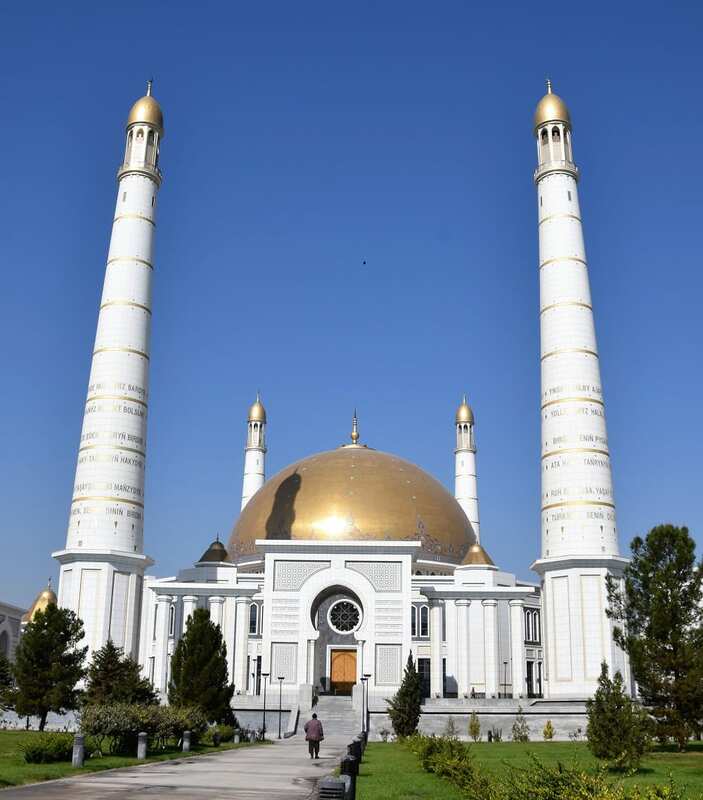 The huge mosque is built in memory of Turkmenbashi and his family mausoleum is alongside, suitably guarded by goose stepping soldiers. Then, back to the train, which has crossed the Caspian Sea on a ferry. It’s the first time, on this journey, that I’ve sat in my cabin and been able to look out in daylight. So far all I’ve seen is acres of scrubby flat desert, a herd of camels grazing and the odd industrial plant, which I assume is for the extraction of the natural gas which is the country’s main export. Gas certainly contributes to the country’s most impressive sight. The Darvaza Gas Crater in the middle of the Karakum Desert has been alight since the early 1970s when a gas rig collapsed, creating a huge hollow. It was lit deliberately to eliminate the leaking poisonous gas. They thought it would take a week to burn out. It’s astonishing in the dark, like a giant cauldron, and we tiptoe round the edge with torches and then, at Tino’s insistence, scramble up a much too steep hill for the view, tumbling into thorn bushes on the way. There’s definitely no way back out if you fall in, assuming you don’t catch light straight away. The showers in our compact cabins are a little annoying, as you have to keep your hand on a knob to maintain the flow of water. It’s not easy to do this and spray yourself holding the showerhead simultaneously. Shane suggests that we should adopt the yoga Tree Pose, standing on one leg and pressing the knob with your knee. I’ve tried it, but it’s not hugely comfortable. We’re supposed to be over the border in Uzbekistan when we awake, but the train is still sitting at Dashoguz on the Turkmen border. They seem to be changing the engine. 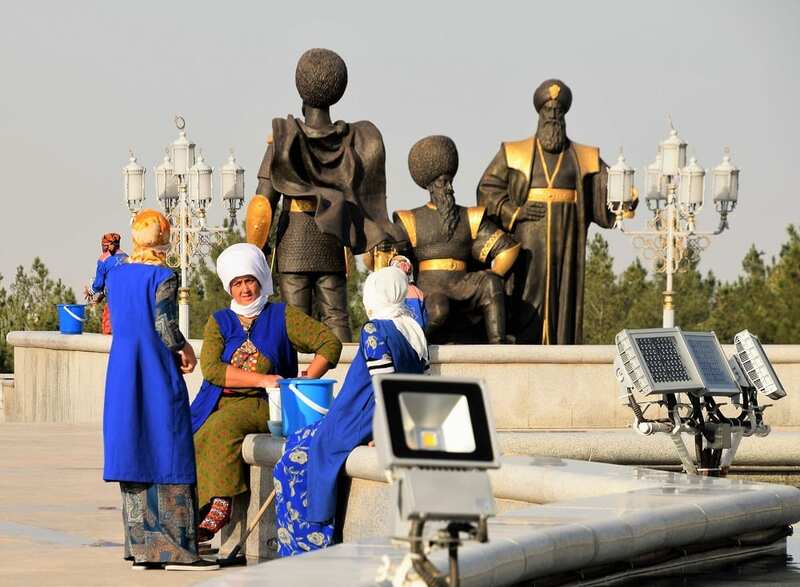 Here, there’s a built up area and an insight into the real Turkmenistan. The houses are mainly crumbling clay and stone shacks, though they all have a satellite dish on the roof. There’s an Uzbek flag waving tantalisingly in the distance as we, perplexingly, reverse out of Dashoguz station. We’ve decided the drivers are more used to freight trains as they have not yet mastered the art of braking smoothly. Everything in the carriage topples over as we halt. I was wrong, that wasn’t the Uzbek flag, it was the Turkmen flag – Dashoguz must have been a terminus and this is the border area. There are soldiers observing alongside the track every 100 metres or so now. Uzbekistan here I come. Farida is re-joining us when we do finally get there. She was refused a visa for Turkmenistan, no explanation given. 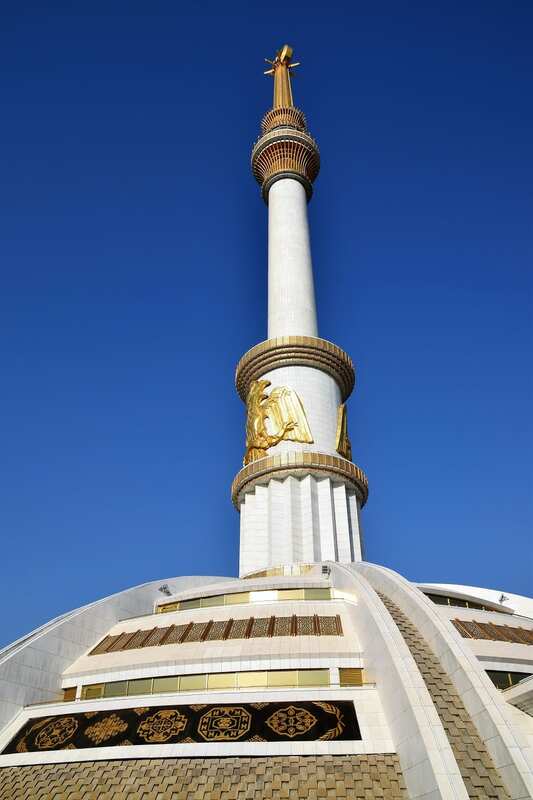 To see more of my photos of Turkmenistan, visit this page. Roughly 80% of Turkmenistan is covered by the Karakum (Black Sands) Desert. Turkmenistan has four distinct seasons with temperatures ranging from over 50 degree Celsius to below zero with snowfall. Written Turkmen has gone through a vast number of different alphabets. Prior to 1929, Turkmen was written in the Arabic script. Between 1929 and 1938, a Latin alphabet was used. Then, from 1938 through 1991, the Cyrillic alphabet became the official writing system. In 1991, a new Latinate alphabet was introduced, but it has been slow to catch on. Almost 90% of workers in Turkmenistan are employed by the government.